My new house has a Thermador range with gas burners and gas oven. I've used it a couple times since moving into the house, but it has a strange problem. When using the oven to bake something, the flames will ignite, then sputter and flicker as the oven comes up to temperature. It seems to bake okay, but the noise from the flames doesn't sound normal. I checked the oven's manual to see if the thermostat has some sort of proportional control so that it tapers off the gas valve as the oven approaches the set temperature. It does not. The flames are supposed to ignite fully, then extinguish altogether. Anyway, it seems the root cause of any sort of flame problem is almost certainly the ignitor. 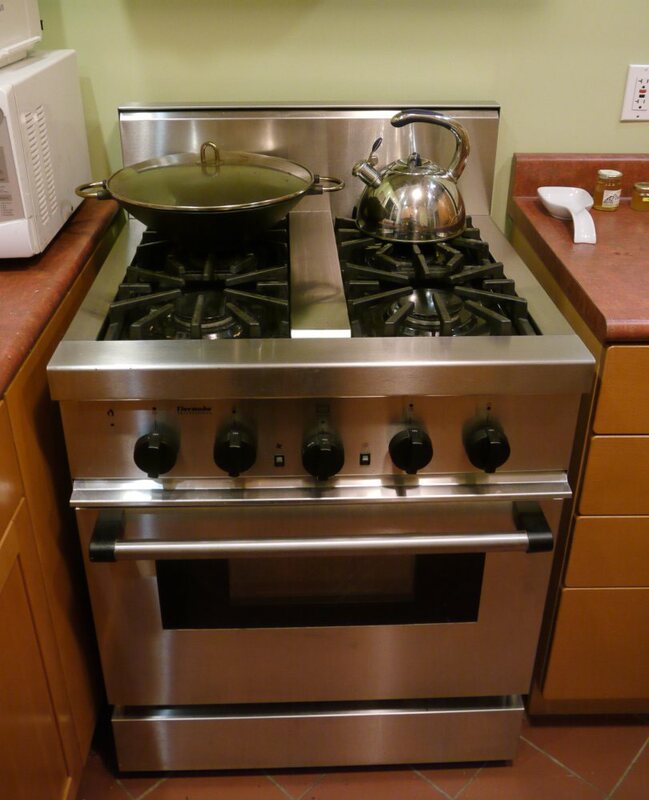 This oven has a "hot surface ignitor", which is basically just a heating element that is positioned close to the burner. 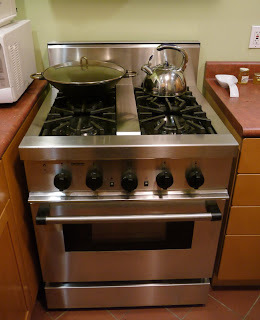 When the heating element is activated, it becomes hot enough to ignite the gas mixture coming out of the burner. Once the flame is ignited, the heat from the flame will keep the ignitor yellow-hot. As a safety feature, the oven is designed to only allow the gas valve to open when the ignitor is yellow-hot. If the ignitor cools down, the flame must have gone out, and the gas should be shut off. The oven determines the temperature of the ignitor by passing current through it. As the device heats up, it's resistance lowers and enough current flows to activate the gas valve. If the resistance becomes too high (because the ignitor cools down), the gas valve is shut. Ignitors apparently wear out just like light bulb filaments, and eventually their resistance slowly increases over years of use. Eventually, the resistance rises high enough so that the gas valve is just at the cusp of being activated. As the ignitor's resistance fluctuates just around the point where the valve is being switched, the flames will sputter and the oven will not heat as quickly as it should. As directed by troubleshooting guides on the 'net, I put an ammeter in line with the ignitor while the oven was running: 2.9A. It should be 3.2 to 3.6A. I searched for genuine Thermador replacement parts, since I wanted to keep this oven in original condition. The Thermador website seems to require a registration just to browse for parts, and did not seem very end-user friendly. Forget that! I found some aftermarket ignitors sold by online appliance repair sites for about $80. Then, I found a general fits-all flat-style ignitor for $40. Then, I checked eBay and found a general flat ignitor for $13.50 plus $4 shipping. I figured that I would try it since it was so much cheaper than the rest it would be worth the gamble. 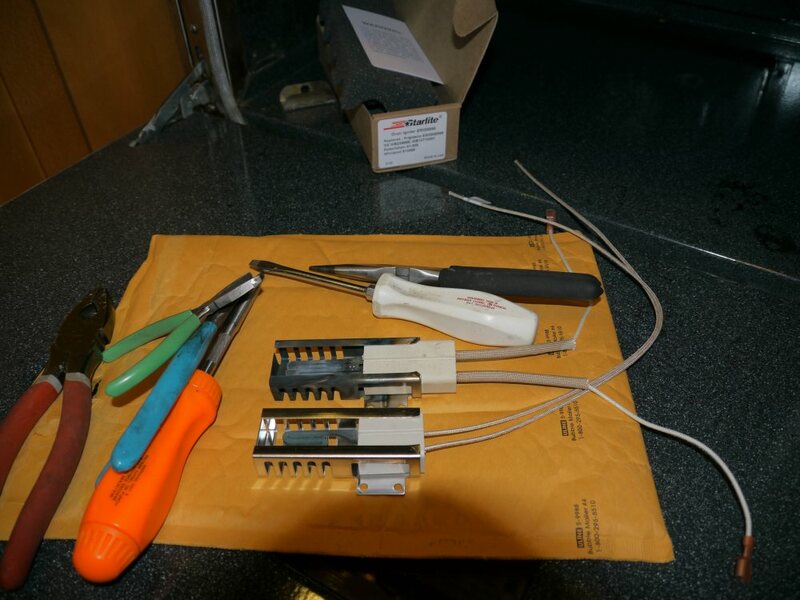 The new ignitor is below the old ignitor in this photo. They are very similar. The new part has two mounting wings, while the original had only one. The length of the stainless steel cage is identical, and the ceramic insulator is a little shorter on the new part. I installed the new ignitor and the oven works perfectly. The gas snaps on, the flames are steady, then the flames snap off when the thermostat opens. Great! 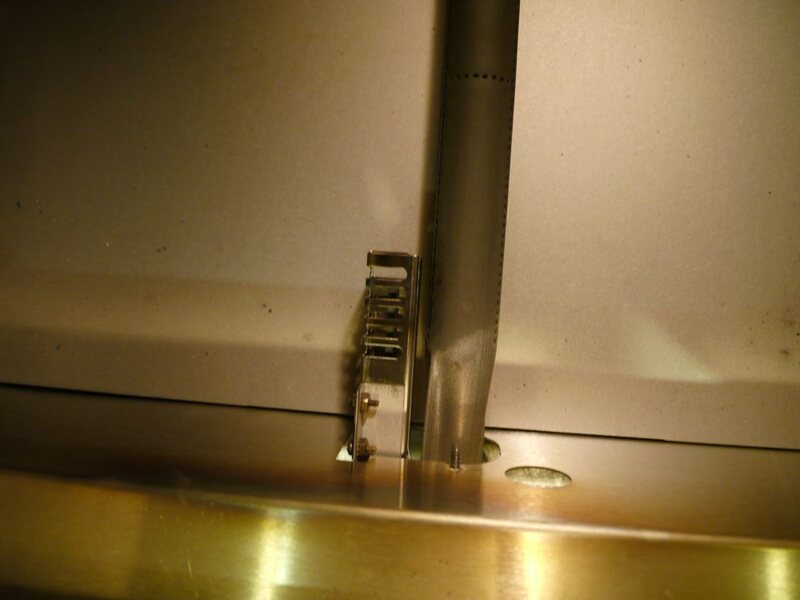 Here's a shot of the ignitor near the burner tube. 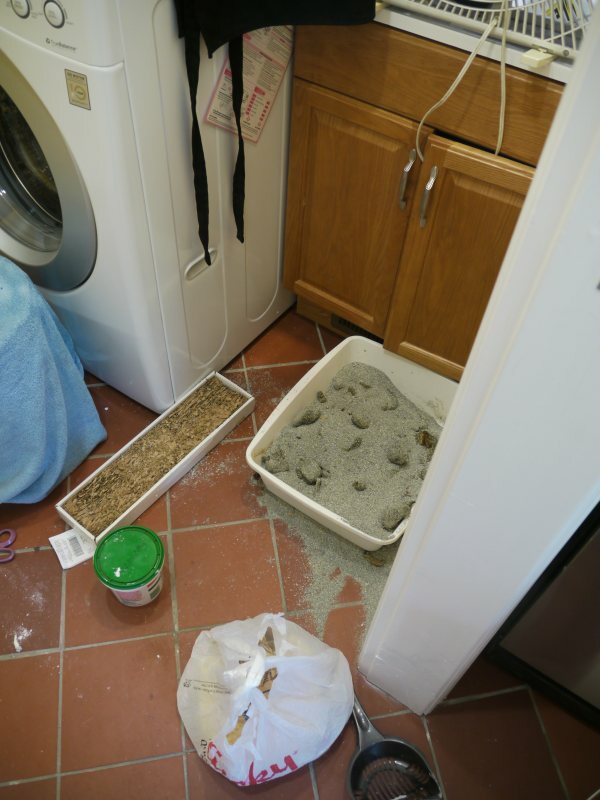 In my old house, I had a large bathroom and was able to hide my cat's litter box under a large counter top beneath the sink. In my new house, the bathroom is too small, so I had to move the cat box to the laundry room. 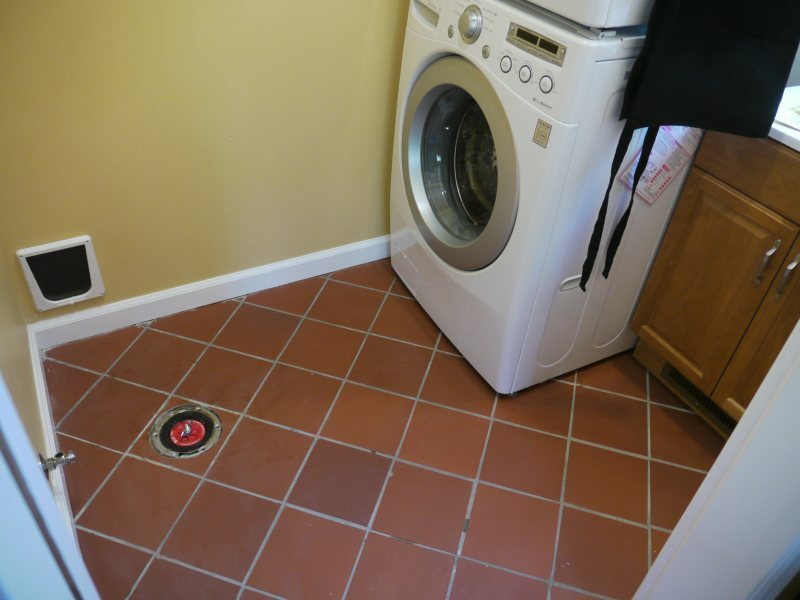 Unfortunately, the laundry room is also small, and adjoins the kitchen with a door that remains open nearly all of the time. After a couple weeks, I was already unhappy with the sight and smell of the cat box near the kitchen and decided to improve the situation. Nasty cat box right near where I cook food. 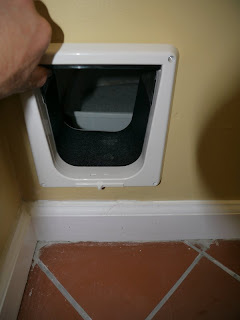 This will not do, but my new house is very small, and I didn't have a good place to put the cat box. The solution was to cut a hole in the laundry room wall, and setup the cat box in the utility closet, which is normally accessible only from outside the house. 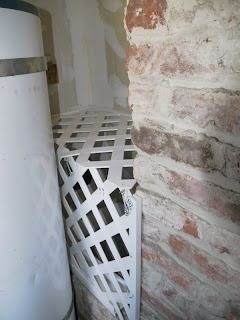 The bricks on the right make up the backside of the fireplace, and the white cylinder on the left is the water heater. I built a shelf that sits on part of the fireplace bricks and is also supported by the wall. The cat box fits perfectly into this space on the shelf. 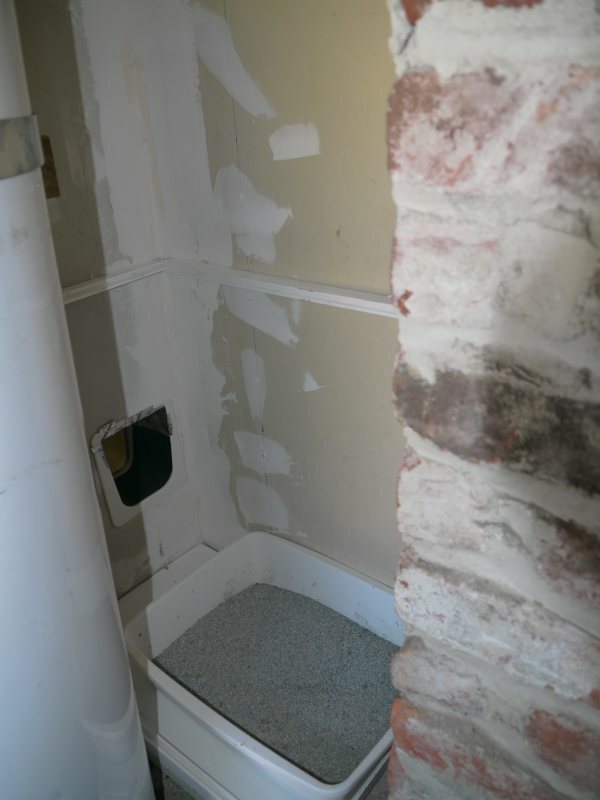 The utility closet is open to the crawl space under the house and also contains the furnace, water heater, and other things that I would rather the cat not know about. I got some plastic lattice from Home Depot and built a small enclosure around the cat box shelf. The Depot also sells plastic track that accepts the edge of the lattice panels. I used some hooks to make the panels easy to remove. I will have to remove the panels to clean the cat box. The cat door is a Petsafe Delux 4-way cat flap ($13). It was intended to be installed only in doors -- not walls and hence was not deep enough to extend through the whole wall. I used some 1/16" ABS plastic sheet, permanent double-stick tape and duct tape to make a tunnel through the wall. After a few hours, I already notice the air smelling better in the kitchen and I was able to convince the cat to walk through the door on his own accord. It seems this project is a big success! I recently bought a SecurityMan ClearCam so that I can see who is at my front door when I am out back in the shop. The advertised range was 330ft clear line-of-sight. In my installation, the camera will have to beam its signal through walls, and the the distance will be about 150ft, so I thought I would be fine. The reception turned out to be pretty bad, so I added an antenna that is more directional than the included quarter-wave piece-of-wire antenna that comes with the unit. 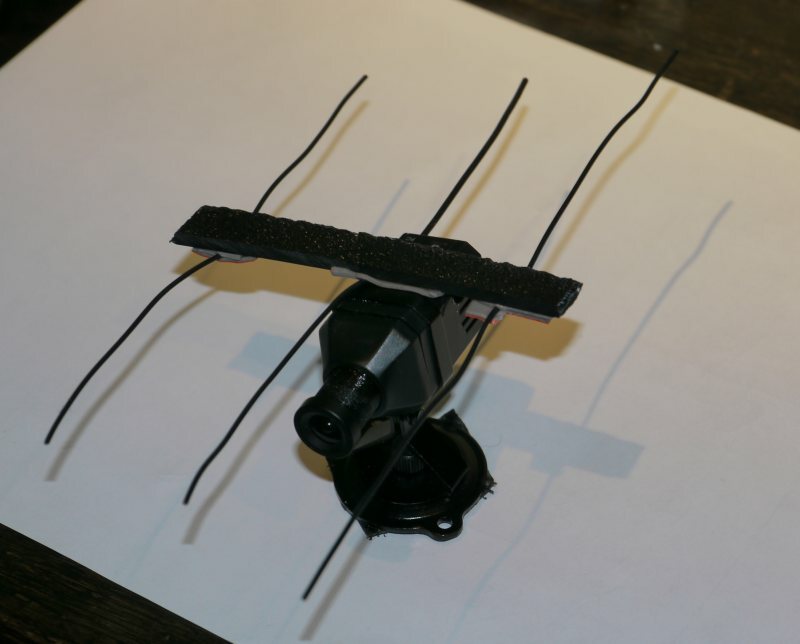 I built a 3-element Yagi antenna that was designed for 910 MHz, which is what the camera claims to use. I built a corresponding antenna on the receiver. This arrangement provided a helpful improvement, but the reception at 150ft through some walls is still not %100. Frustratingly, the image appears perfect, then suddenly degrades and goes completely black, then returns to perfect again every 10 seconds or so. I have no idea why this would happen. 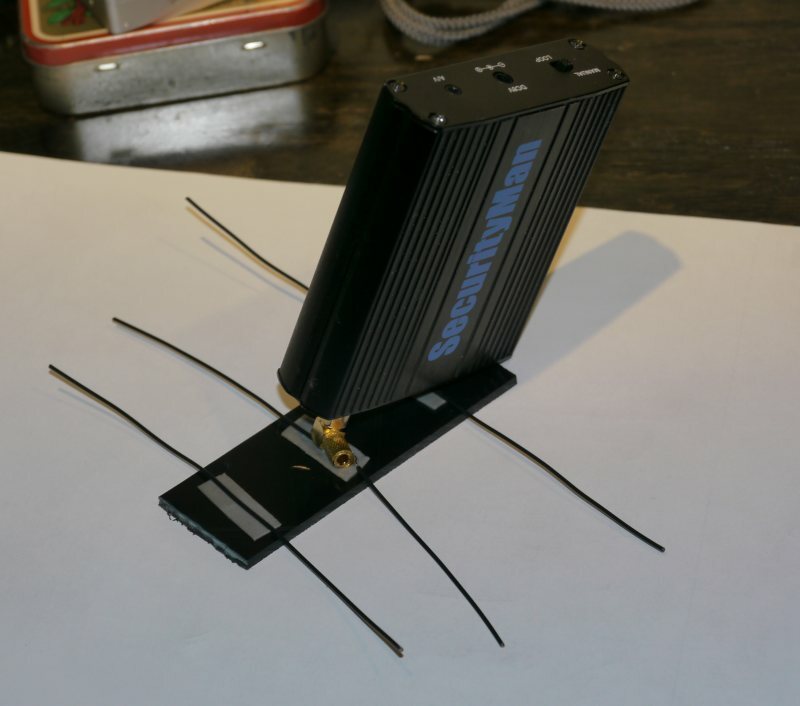 The 910MHz band was specifically chosen to avoid interference with 2.4GHz devices such as WiFi. Oh well, it seems to work well enough for my application.